Note: Pay N Go! Peach Pass Reload Cards can be used for a one-time violation payment. The card cannot be reloaded again to pay future violations. A new Reload Card must be purchased for future toll credits or violation payments. A reload card payment for a violation can be paid online only. If you have a non-Georgia license plate and received a toll violation from SRTA or Professional Account Management LLC., this means that a Peach Pass was not detected in a vehicle registered in your name while using the Georgia Express Lanes. If you do not pay the outstanding charges, you face escalating fines and penalties. Failure to pay the proper toll on a toll facility is a violation of O.C.G.A. § 32-10-64 (c)(1). 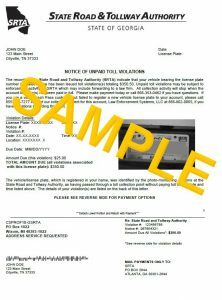 In such event, the registered owner of the vehicle is liable to make prompt payment to the State Road and Tollway Authority (SRTA) for the proper toll and an administrative fee of $25 per violation to recover the cost of collecting the toll. Failure to make payment of the proper toll and the administrative fee, per violation, will result in SRTA referring the matter to a collections agency and/or the Attorney General, who will move to obtain an Order against the registered owner of the vehicle from the Office of State Administrative Hearings (OSAH). If OSAH determines that violations of O.C.G.A. 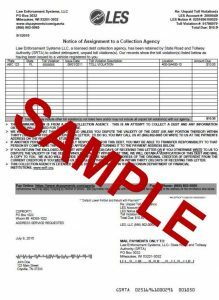 § 32-10-64 (c)(1) occurred, OSAH will issue an Order again the owner who will be liable for the tolls and administrative fees as set forth above but also an additional civil penalty of up to $70 per violation. The vehicle registration will be suspended if payment of all tolls, administrative fees and civil penalties, which can be up to $95.50 for each violation, is not received by SRTA within 30 days following the judge by OSAH. SRTA may also report the bad debt to credit bureaus.